As you approach the entrance to the Guesthouse, you will note a long, high wall along the perimeter. 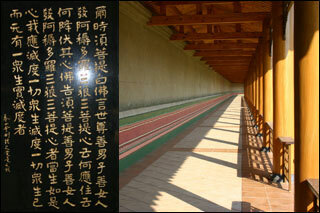 This is the Sutra Wall, which is still under construction. When complete, it will provide a Meditative Walk for retreatants and devotees, visiting our Temple. They will be able to walk along the wall, reading the Lotus Sutra, which is carved on the granite tablets, still to be attached to the wall. The Lotus Sutra contains very profound teachings of the Buddha and may be accessed from our “Web links”. Please note that each of these carved granite tablets has been donated by a devotee for this project and in this way they will be contributing to the propagation of Buddhism in a lasting and meaningful way. Enquiries concerning the donation required for one of these granite tablets can be obtained from our Temple management.